The lorikeets, as well as the lories, are Psittaciformes belonging to the family of Psittacidae, subfamily of the Loriinae. They are birds of small and medium dimensions, with brightly coloured liveries, distributed all over the eco-geographic Australasian zone, from Papua New Guinea and nearby islands (Maluku, Marquesas, etc.) to Australia, up to south-eastern Asia. They are birds which have evolutionally colonized various biotopes; obviously, the zygodactyl foot has favoured them in the arboreal life. So we find them both in the pluvial tropical forests (in the inland as well as in the periphery, close to urban areas), and in the gallery forests, along the rivers, or those of eucalypti, typical of Australia, or of palms, typical of many islands and islets of these areas, but this doesn’t prevent them to live also in the bush, brushwood, prairies, savannahs, and in the Mediterranean copse of such regions; in some cases, they may even adapt to live along the beaches, close to the brushwood present there, as well as in the hilly and mountainous forests. The lorikeets are smaller than the lories and are the smallest members of the subfamily of the Loriinae. The group of the lorikeets is subdivided into four genera: the lorikeets of the genus Charmosyna, those of the genus Glossopsitta, those of the genus Trichoglossus and those of the genus Oreopsittacus. Some ornithological biologists consider as fifth genus of the lorikeets the Loriculus, called of the hanging parrots, others consider these ones as a separate group; the International Commission for Zoological Nomenclature (ICZN), has not yet expressed a final judgement about this matter. In the specific of this text, the Musk lorikeet (Glossopsitta concinna – Shaw, 1791), belongs to the genus Glossopsitta. This Australian species, practically is almost unknown outside Australia; it is found in Europe only in two zoological gardens, the Lor Parque of Tenerife, Canary Islands – Spain, and in the Sanary Tropical Garden in the south of France. It is called musk lorikeet due to its moss-green livery characterizing it. It was discovered by the English ornithological biologist, George Shaw, in 1791, during his scientific voyages in the Australian continent. This English biologist was also one of the first to study a Platypus (Ornithorhynchus anatinus), which he described, along with other typical animals of the Australian fauna, in his opus, “Zoology of New Holland” dated 1794. The genus Glossopsitta, is formed by three species, the Little lorikeet (Glossopsitta pusilla), the Purple-capped lorikeet (Glossopsitta pusilla), the Purple-crowned Lorikeet (Glossopsitta porphyrocephala) and the here treated Musk lorikeet (Glossopsitta concinna). Among the three, the musk lorikeet is, in all probability, the most beautiful and for this reason is considered, and also due to its sweet character and its good adaptation to live in artificial environments, an excellent aviary ornamental bird, utilized for this, however, in Australia only. They are endemic to Australia. They carry on chiefly an arboreal life, often do live in 20-30 individuals communities, forming colonies on the branches of the trees and are very melodious. They may also get down, walking on the ground for short distances. As an average, both male and female measure 23-25 cm. Both have a red face, more precisely: a bright red coloured dot on the face, the front, the cheeks and the same extends behind the eye, which has a black iris and is surrounded by a red ring of skin in both sexes. The body is moss-green, for the primary and secondary coverts of the wings, the remiges, the feathers of the back and the belly, as well as the rectrices of the long, thin tail. Actually, the back has a duller green colour, closer to the olive. On the sides, close to the junction point of the wings, in both sexes, we see a vertical yellow spot, on each side, which goes down towards the belly. On the head, for both sexes, there is a sort of turquoise powder puff, spotted of yellow. The beak, small and hooked, has a shaded dark grey-red colour, for both sexes; they have a zygodactyl foot. The transitory-seasonal sexual dimorphism as well as the permanent one, are therefore absent. They nourish mostly of dried fruits and seeds, they are therefore frugivorous and granivorous, but they do not disdain flower petals and nectar. When in captivity, they are to be furnished of assorted seeds and dried fruits without shell. 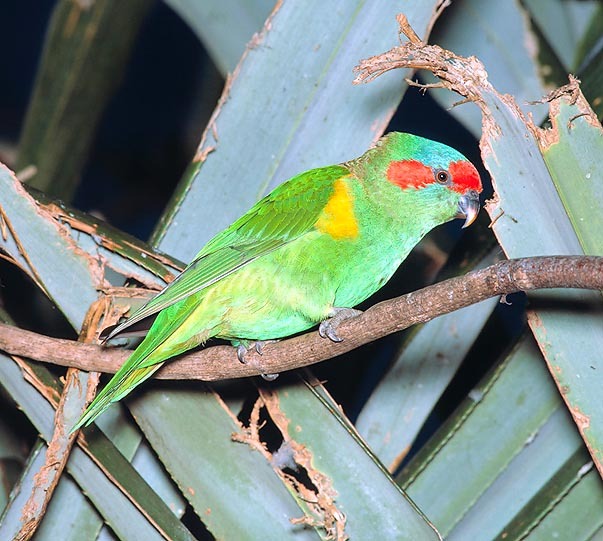 The Musk lorikeets (Glossopsitta concinna), like the other two species, differ from the other genera of lorikeets because the females lay a greater number of eggs, 3 to 5. Furthermore, the pullets remain in the nest for a shorter period; the species among the three where the pullets stay less time in the nest, is the Little lorikeet (Glossopsitta pusilla), as when 40 days old they already fly to make their own life. Usually, in the case of the Glossopsitta concinna, they get away when 50 days old. The male of the Glossopsitta concinna builds up the nest, in the young pairs as well as in the stable ones. The eggs are hatched by the female only, whilst the male takes care of nourishing the pullets and the partner. For the time being, as they have not been subjected to intense commercial trades, this species doesn’t belong to the red list of the IUCN.